Chloe's adventures as a sister missionary! Wow, I can't tell you how happy I am for Hermana Myers and everyone she serves and serves with. She is such an amazing servant of the Lord. Although she is better prepared and more awesome than I ever was as a missionary, some of her stories makes me realize the apple doesn't fall far from the tree and if any of my NCRM family is reading this I think you are probably laughing and thinking the same thing. I have a lot I want to say so this may be a jumbled hot mess. I don't know which picture you're talking about and I would love to tell the stories behind them, but alas, I cannot right now so you may just have to wait until I get home and I can look at all of them. BUT me, Hermana Stevenson, Hermana Bates and Elder Twitchell are in the Redlands mission, Hermanas Edwards and Hartling are in Riverside and Elder Burbidge is in Carlsbad. He's actually in Murrieta so you should tell the Roberts to try to find him. Spanish speaking, short, blonde. Yup. Hermana Rosales speaks about as much English as we do Spanish. It's been great and my vocabulary and grammar is getting better. The other sign is that her English grammar is getting worse, haha, gotta love that it should have been "are getting better." So remember how I told you about how we got our Zone Leaders' truck to drive up to Riverside? Yup. I drove. It was magical. And we decorated the truck with stickers and sticky-notes. So that explains some of the pictures. It was great. I was also filling up the bed of the truck with the bikes and the suitcases, trying to play tetris(as is making everything fit) and get everyone's stuff in the back and all of a sudden, President Smart just popped out of nowhere and started organizing everything with me. I got down out of the bed as ladylike as possible and then laughed at the fact that he scared the crap out of me. Oh yes. Happy belated Father's Day to Dad and Birthday to Kenzi. This week was really uneventful between trying to get Hermana Rosales settled in and weekly planning so I really don't have much to say on that account besides what I already said. We tried to go hiking this morning before the P-Day activity but the only place we could find was a lamesauce trial that went around the mountians a little bit (I say a little bit because it loops around itself for probably only a mile) instead of up the mountains. So I have an idea. How would the Myers family feel about picking me up in California after the mission? Great? Sound like a good idea? I thought so. A copy of your hymns CDs that you have of the male quartet? I think it is...? ALSO: Mom, you gotta check this book out and maybe buy it. It's called Our Latter-Day Hymns: The Stories and the Messages by Karen Lynn Davidson. It. Is. So. COOL!!! I read the one for How Firm a Foundation and almost cried. I was going to send it to you but I left the book at home. ALSO AGAIN: Do you know what you, Dad, Uncle Rhod, Uncle Jeff and anyone else in our family that's served a mission did with their missionary tags? I have a really cool art project in mind for when I get back. I think that's everything... I hope this week is a little more eventful for me so it's more interesting for you. Oh yeah, one more thing: We volunteered today to walk the dogs at one of the kennels in Cathedral City. Woot woot! Next Monday Hermana Myers will be sending her new mission president a letter this is his bio from the Church News and the boundaries on the CA Redlands Missions found on the CA Redlands Mission blog. Daniel Joseph Van Cott, 44, and Emily Morrey Van Cott, five children, Suncrest 5th Ward, Orem Utah Suncrest Stake: California Redlands Mission. Brother Van Cott serves as a bishop and is a former counselor in a bishopric, ward missionary, Primary teacher and missionary in the Costa Rica San José Mission. Business owner, real estate and development, and owner/manager of an online school. Born in Salem, Ore., to John Frank and Trudy Eilene Van Cott. I'm sure this is a form letter but it is still fun for us to read. Please take the time to change her address in your address book. Last February the First Presidency announced the creation of 58 new missions. 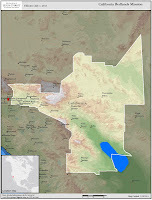 That announcement included modifications to the California Riverside Mission boundaries. 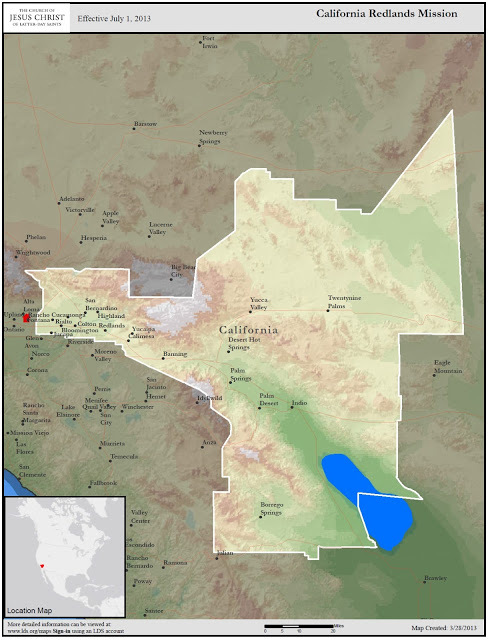 Beginning in July, those boundary changes will move four of our zones (Palm Desert, Redlands, Yucaipa and Yucca Valley) into the California Redlands Mission. A fifth zone (Murrieta) will transition to the California Carlsbad Mission. Seven zones (Corona, Hemet, Jurupa, Lake Elsinore, Menifee, Moreno Valley and Riverside) will remain in the California Riverside Mission. Separating our mission into three pieces has been a difficult assignment for us, even though we realize the growth and opportunity it represents for the progress and maturity of the Church here. With this change, about 40% of the missionaries we currently serve with will be working in a different mission with a different mission president. This is a hard thing for us; kind of like sending about 100 of our own "adopted" children off to the mission field, all on the same day. I tried to describe the change to our missionaries as a "longer transfer than normal" and look forward to having opportunities to see everyone from time-to-time when we finish our missions. We love Sister Myers, and have loved serving with her. She brings great strength to the work here and our association with her has been a great blessing to us as well as all those she has served. Thank you for your love and support. Just recieved this from the mission office, happy Hermana is working hard! Your daughter, Sister Lydia Chloe Myers, has been given the new assignment to serve as Trainer of a newly arrived missionary. She has received this assignment because of her dedication and unselfish service and because of the confidence the Lord has in her. She is a fine missionary. The position of Trainer is considered the most important assignment in the mission, for it is the Trainer who establishes the foundation for her companion's success and the ultimate success of the mission. We appreciate her willingness to be an exemplary missionary. We thank you for your continued support and prayers for your missionary and the work in the California Riverside Mission. Good news! As of July 1st 2013, your daughter will be laboring in the California Redlands mission!! Woot!!! YAY FOR A NEW PLAQUE!!! Can my scripture be 3 Nephi 5:13? Thanks! So remember that investigator I was telling you about that makes fun of our Spanish? Yeah, we dropped him. Not because of the frustration but we were having a lesson with him on Tuesday and we were asking him about if and when he prayed to know if he should be baptized. He kept getting off subject and I wouldn't let him. He kept trying to tell us about the weird dreams he was having after he prayed. I told him the dreams weren't important but I wanted to know exactly what he was feeling while he was praying. He said nothing. His roommate, who is a member and our Ward Mission Leader, was telling him that he needs to pray again and all that. I invited him to pray right then with us and he was making excuses like he was tired and it had been a long day and started to walk into the house. The only thing I could think to say was that if he didn't pray right then, we wouldn't come back. And he kept going into the house. So we're not going back until he's ready. Oh yeah! So remember how I told you I'd probably be training this transfer? Guess what! I'm in a trio again! Woot!! I don't think I'll ever not be in a trio in my mission... so far so good. Also, we (and I mean we because we're taking turns) get to drive the zone truck up to Riverside to pick up the new missionaries (there's another sister in our zone that's getting a new sister) It. Is. So. EXCITING!!!! I want a truck. A red, 1965 Chevi (hint hint ;)). Thank you for keeping me updated on my other missionary friends. I was going to email Sam and Mary today but now I don't know if I have time. Sad day. BUT I love you all aaaand yeah. Peace and love and enjoy the pictures. P.S. I almost cried today because I had been looking forward to flying a kite that we bought at the dollar store for a week and then it didn't even work. Cheap piece of poo... All I want is to fly a kite on my P-Day. Is that too much to ask? Who can even guess what she is doing? Hopefully it is a facial mask and not Elmer's glue! Hermana Fogg and Myers, the best of the Midwest taking California by storm! Not sure what this group of missionaries stands for except that all the sisters in her MTC group are here. She misses her Uncle Jeff. From other pictures I am guessing that this is a couple working in their zone. Couple missionaries are such an asset to any mission zone. Preparation day, cookin up some grub. I Am So Proud of My Little Hermana! Also, if you wouldn't mind sending out my bright orange hat, we have zone activities on P-Day outside and I would greatly appreciate it. On Monday we had our first zone activity and it was a blast! Sadly, nothing else really came out of that day. On Tuesday we went over to our investigator's house (Valerio) to try to figure out why he wants us to come back because he wasn't really progressing and it's always hard to have a lesson with him. Usually he's super hard to understand, talks really fast, get's way off track and then makes fun of us for not knowing what he's talking about... So we were trying to figure out whether or not to actually keep teaching him. We were as bold as we could be in our broken Spanish and we decided to keep teaching him. We went to the temple on Tuesday as a zone. It was great! There was a moment in the Celestial room when we were all in there together and about half of us realized it and smiled at each other. Good times. Sadly nothing really happened during most of the week. It was in the 110s the whole week so no one wants to do much of anything, and we don't blame them. I think the hottest it got was 118? Fun! On Friday we had a lesson with Valerio again. We actually had a pretty focused lesson about the Plan of Salvation. I usually get scared teaching the Plan of Salvation just because I like to over complicate things and the Plan of Salvation can easily be over complicated, but we didn't! And it was good! He seem like he really got a lot of it but he was pretty stuck on the fact that no one really practices what they preach. I tried to tell him over and over that the point is that we try our hardest and the times when we might not make it all the way, that's when we can really use the Atonement... but he kept interupting me. But it was pretty good, none the less. On Saturday we had a lesson with a mother and daughter. The mother's name is Evelia and the daughter is Chelsea. Oldly enough, Evelia is extremely receptive and loves everything we teach her and Chelsea is the extremely Catholic one. Usually it's the other way around. But we were teaching them about the Restoration and Evelia got everything. And she was asking about the cross-references and how to use them so she could understand the Book of Mormon better. And we also had to clarify that Alma is a man because apparently her husband left her for a woman named Alma. Awkward. Also, we send little scriptures to our investigators every night as a form of daily contact. Evelia was telling us about how one of our scriptures (D&C 6:36) came just in time because she was having a really rough time. The Church is true. I really wish that I could tell you more in depth of how our lessons go but I really don't know what to say. And a good chunk of the time I'm not entirely sure I know what's going on. On Sunday we had a member from the Thermol ward come with us who was a fluent Spanish speaker and she just got back from her mission in November. She was super helpful! We did two harvesting blessings with her (I don't remember if I told you what those are. It's when we talk to the family about their needs and then as representitives of Jesus Christ, we leave a blessing with them. I believe the Elders actually do a priesthood blessing kind of thing, I've never actually witnessed it... but we just pray for them right there. It's great) Then we had another lesson with Valerio. Like I said, he likes to make fun of us because we don't understand everything, and he said that to her and she stood up for us a little bit. I got more frustrated in that lesson than I ever have. So much that I cried. Not only did I have a horrible time trying to understand Valerio (of course I understood every word Angie said, not Valerio) but I also had a horrible headache to the point where I would look at Valerio and my eyes wouldn't even register that I was looking at him. No bueno. So that was my week. Sorry it hasn't exactly been spactacular. We'll try to be more interesting this week :). This week I decided in my email to Hermana Myers I would ask questions and leave space for answers. We the answers weren't too long (more like her Dad than Mom in that area)but fulfilling. So my questions will be in italics and her answers will follow. At the end of my letter to her I also copied and pasted some emails I received from some of you with nice things about Hermana Myers, thus the shout out to our friend Christina and Sister Argyle, her helper at the temple. Oh and I also included some info I gathered about her friend Mallory who had a baby. I guess I forgot to gather the name so Mallory if you read this please email her. So will you get to see all your buddies from the MTC and find out where they are now on temple day, the 4th and transfer day on the 15th? I actually don't know who I'll see tomorrow because we go to the temple by zones (usually one or two at a time) so I don't know 1. Who we're going with and 2. Who's in what zone. We'll find out tomorrow, I guess. However, on the 15th we're having a huge conference in Marino Valley and that's when we'll find out who's staying in the mission or not. Woot woot. Exciting stuffs. Do you know where any of them are now? How about Hermana Fogg, where is she from in IN and where did she live in Iowa, have you asked yet? I know that Hermana Edwards is with Hermana Fogg's companion from the MTC but I don't know where, Elder Twitchell is with Elder Green (I know his brother Weston from school) but again, don't know where, Hermana Stevenson is in Yucaipa (sp?) and Hermana Hartling is near Corona. Hermana Fogg is from Indianapolis and lived in Norwalk, Iowa. What about your investigators? Although it seems many of your stories are funny we won't mind hearing spiritual ones as well. I am sure the language is a struggle but I am confident you can grow and learn and do what you need to to help the spirit convert people. However there was this one lady on Saturday night that we gave a harvest blessing to that was AMAZING!!! Too bad she speaks English so we had to give her to the Elders. Her name is Brandi and she is 66. She just had a major surgery where they practically took off her face. She died on the table and she said that she pretty much had a vision of someone pushing her back as she was trying to go forward, then she saw two silouettes (sp?) walking towards her. Anywho, she made it through, obviously, but when we were walking towards her to talk to her she just said that we looked like angels. After the blessing she said that now, she would never have a doubt that there is a God and that He loves her. The elders that we gave her to went and talked to her on Sunday and I guess she called us her guardian angels. She's on date to be baptized on the 15th of June. Are you learning anything from your scripture studies? Share! I learn lots of things. I'm just reading through the Book of Mormon so it's just things that I didn't realize before, like, ya know, the chronology of it. And that Abinadi glowed. Did you ever eat the menudo? Sandi read me your letter to her about the cricket and iguana but I wasn't sure if you had be served the menudo or not? I thought I said that I didn't have menudo... And sorry I totally forgot about the cricket. I was sad. Also, Hermano Cardoso (the one that feeds us funny foods) has these little, itty bitty peppers that he had us try yesterday. It then turned into a competition between me and Hermana Fogg of who could eat the most. We both stopped at four and thought we were going to die. Are you driving now, do you switch off or are you just copilot? I can't drive until my first 6 weeks are over. But once they are, if me and Hermana Fogg stay together, then we'll just switch off. Is the GPS working well for you? Did the camera make it? Did you feel the earthquake on Wednesday the 29th? It was only a 4.6 and you were 233 miles away so maybe not. I remember feeling an earthquake. I don't think it was that one though. It was before Hermana Chevalier left and the one you're talking about was after. Anything else we can send you? Well the name of Mallory's baby would be nice :). Today we had a zone activity and it was so. much. FUN!!! Also, we have a mini missionary for a week. Guess who speaks less Spanish than we do. Yup. Her. It's a good time :). As far as letters go, I'll probably just keep emailing you because I always say more in my emails anyway. I don't like writing that much... but I love receiving letters! And emails. So whatever. Due to safety reasons I am not posting her direct address. Please get a hold of me if you would like her direct address.